The indicted intelligence officers, members of Russia's GRU military agency, allegedly stole data from the Democrats and the Clinton campaign in a sustained effort to influence voters in 2016. 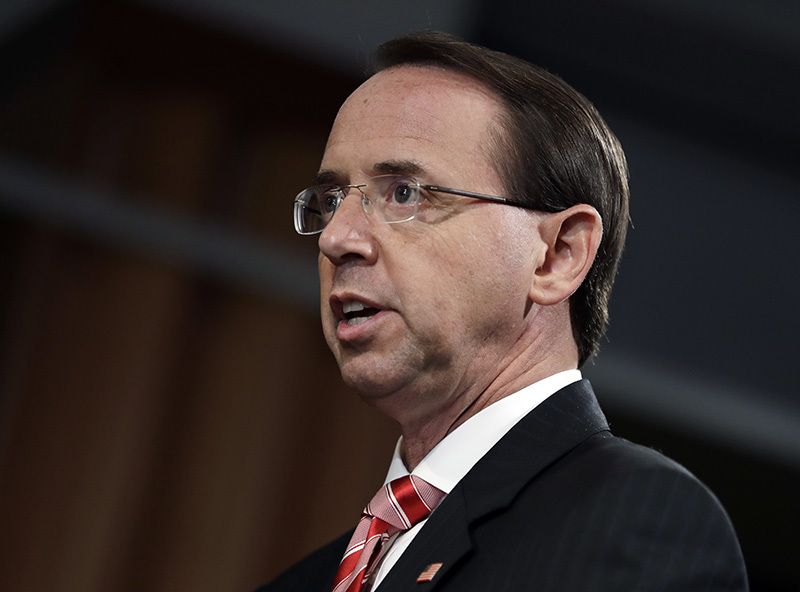 Deputy Attorney General Rod Rosenstein announces the indictments against 12 Russian intelligence officers during a news conference Friday at the Department of Justice. WASHINGTON — A dozen Russian military intelligence officers were indicted Friday on charges they hacked Democrats’ computers, stole their data and published those files to disrupt the 2016 election – the clearest connection to the Kremlin established so far by special counsel Robert Mueller’s investigation of interference in the presidential campaign. The suspects “covertly monitored the computers, implanted hundreds of files containing malicious computer code, and stole emails and other documents,” Rosenstein said. The indictment comes days before President Trump is due to meet with Russian President Vladimir Putin in Finland. Rosenstein said he briefed Trump earlier this week on the charges. One of their conduits, identified in the indictment only as “Organization 1,” was WikiLeaks, the global anti-secrecy group led by Julian Assange, according to people familiar with the case. The indictment describes WikiLeaks communicating with Guccifer 2.0 to obtain material. On July 6, 2016, according to the indictment, WikiLeaks wrote, “if you have anything Hillary related we want it in the next tweo (sic) days prefable (sic) because the (Democratic National Convention) is approaching and she will solidify bernie supporters behind her after,” referring to Clinton’s rival for the Democratic nomination, Sen. Bernie Sanders, I-Vt.
“On or about August 15, 2016, the conspirators, posing as Guccifer 2.0, received a request for stolen documents from a candidate for the U.S. Congress,” the indictment says. “The conspirators responded using the Guccifer 2.0 persona and sent the candidate stolen documents related to the candidate’s opponent.” The indictment does not identify the candidate. U.S. officials identified one of the GRU sections that carried out the operations as Unit 26165, which worked out of a building about four miles from the Kremlin. It was responsible for hacking the DNC and the Democratic Congressional Campaign Committee, according to the indictment, which accuses Viktor Netyksho of being the military officer in command of Unit 26165 at the time. Although the DNC was able to kick the Russian hackers out of its system in June 2016, the indictment says three months later, the GRU “successfully gained access to DNC computers hosted on a third-party cloud-computing service” which held “test applications related to the DNC’s analytics,” according to the indictment. The hacker stole that data from the DNC, the indictment said.